Well I finished another baby object. 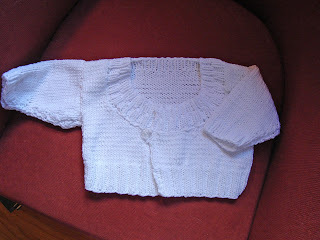 Here is its picture: It is a free pattern from the Berroco e-newsletter, Knitbits, called Baby Picchu. It is a mini version of an adult design that is also published as a free pattern. (This site has a lot of nice free patterns.) I made this one from Lion Brand Cotton Ease (1.5 balls) and # 7 U.S. needles. It is fastened with an old clear glass button. As to how I like it, I have to say 'meh.' I see that expression in some blogs and forums to mean indifference. I don't think I actually say meh. I think I'd say more like 'aeh', but I guess that is harder to put in writing. Getting back to the sweater, I have a feeling that it will be very cute on a baby. It is meant to go with a summery dress in the spring when the weather will be bright but chilly. 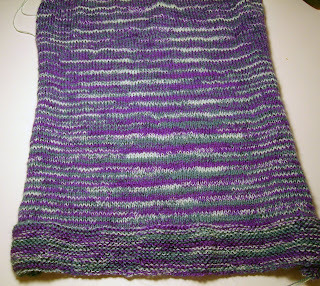 It is a swatch in Knit Picks new handpainted sock yarn, Imagination, of merino, alpaca, and nylon in the colorway Damsel. 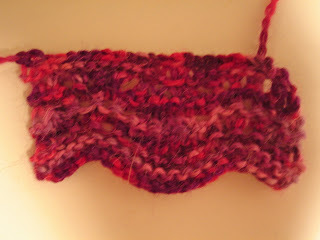 It looks like raw meat, so I won't be making a baby sweater from it. I can possibly see wearing meat socks, but a meat baby sweater - no. What is it with Knit Picks multis? Are they all yuck? Perhaps you will recall the bird doo Klaralund I made from Knit Picks Shimmer. As it happened, I loved the feeling of this yarn (alpaca/silk) and the fit of the resulting sweater, so I was able to overlook the bird doo-ness of the colors. But come on - meat? Actually meat is a euphemism for what it really looks like. Let me be clear on this. It's not me, it's Knit Picks. I never go around say things like "Ew, that looks like vomit." I never even think them. I am not easily disgusted. I like all animals including insects and reptiles, and I can tolerate gore in movies. But Knit Picks has the power to make me sick. I have some Shimmer in shades of brown that I am afraid to swatch. Some yarns are good for only certain projects or stitches or needles or etc. 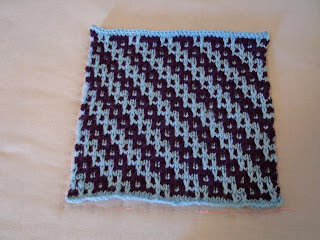 But your afghan squares look great!